Jesse Livermore (July 26, 1877 – November 28, 1940) is one of the most famous legendary traders in stock market. His intriguing hero’s journey in the Wall Street was well recorded in the book – “Reminiscences of a Stock Operator” by American author Edwin Lefèvre. And, this book is widely quoted in many trading books and recommended in many trading classes. But, not many people know about his “Livermore Secret Market Key” which was written by himself and published in 1940. 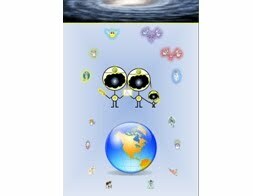 This book can now being found in Wikipedia Link for free download. Jesse Livermore spent up to 40% of his book in explaining the technical details of his operation in the stock market. The challenge is for the reader to understand and implement it. Unfortunately, it is not a simple task to understand the method in table form. For there was no programming flow-chart during his time, he used a table and long procedures to go through how to fill it up. Most beginners will lost his way in their first few attempts. 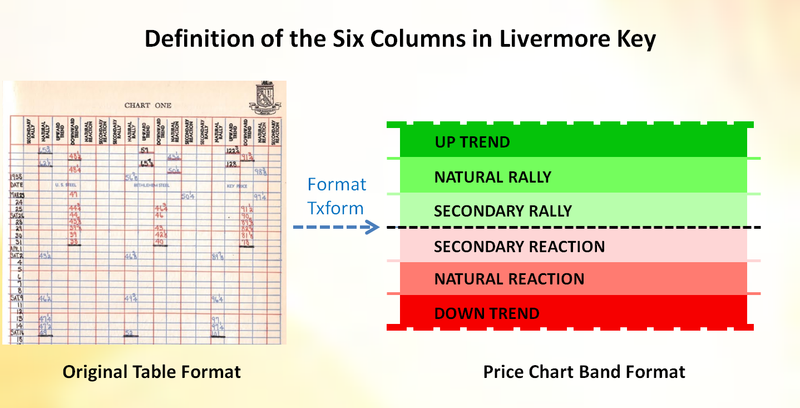 The objective of this article is to demonstrate that the 6-columns table can be programmed into 6-levels of band in modern price chart, and it would faciliate the readers to visualize the interaction of Jesse Livermore Secret Key and the stocks. Fig 1. Transformation of Livermore Secret Market Key from Table to Price Chart. Fig 2. 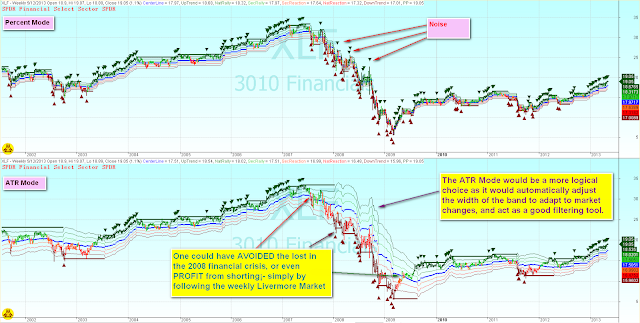 The Livermore Secret Market Key in Action. "Wall Street never changes, the pockets change, the suckers change, the stocks change, but Wall Street never changes, because human nature never changes". So, What do you think? IF he is still around today and using the same method, written 70+ years ago, can he still make money? 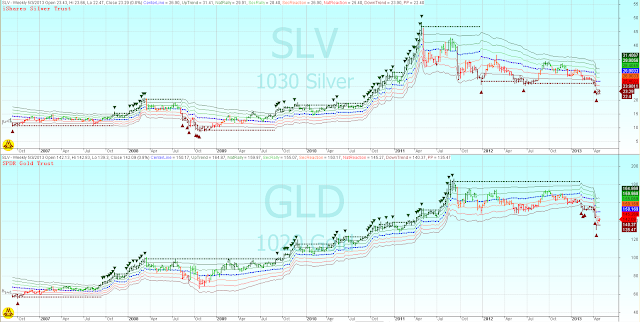 The following are various charts using Livermore Secret Market Key and they clearly demonstrate that he is right. For this method is advocating Trend Trading and ignore minor noise (which means do not run in and out of a stock too frequently). 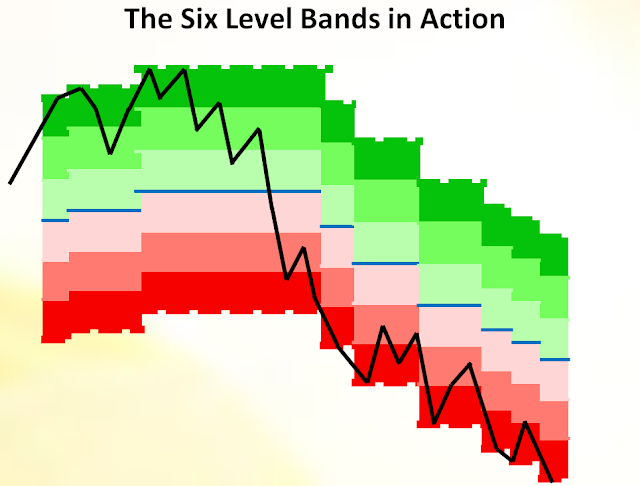 During his time, Jesse Livermore used fixed amount of dollar to define the "Levels of Band" as filter, similar to Point and Figure charting method using 3 point change. But as of today, there are stocks trade more than hundreds or thousands of dollar, so two types of changes can be applied to the original method to see the effect. The first change in the method is, logically, using the fixed percentage change, and second, using the fixed amount of Average True Range(ATR) for the band's level. In Figure 3, the upper chart shows the "Fix Percent Band" while the lower chart shows the "ATR Band". There are two points to be made in Figure 4 (Click and Zoom In). 1) It is Crystal Clear that if one were to follow the weekly chart religiously, he will not suffer from the 2008 financial crisis. For the chart shows a clear down trend. 2) Using "ATR Method" is superior than "Fix Percentage Method", for every stock/commodity/ETF has its own characteristics in terms of Volatility. Using ATR method help to adjust the band-level automatically for all vehicles. So, from here on, the following charts will ONLY use ATR band (Dynamic Band that self-adjust to the stock volatility) as demonstration. Fig 5. 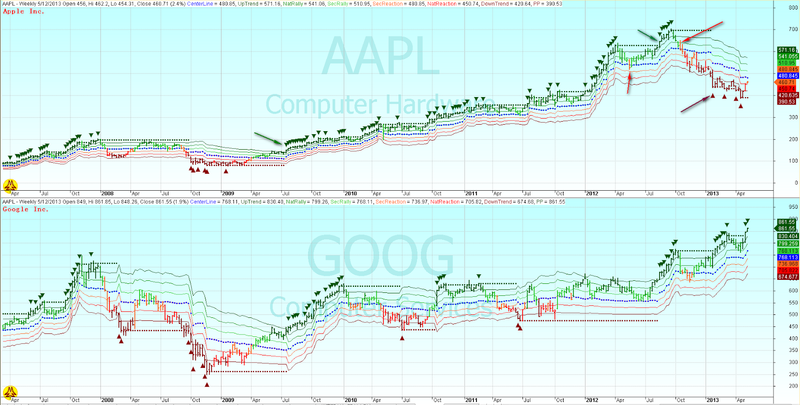 Some Hot stocks - Apple and Google (Weekly). 1) IF the Goal is to make profit from the market, follows the trend. NEVER EVER ARGUE with the price chart. IF the Goal is to PROVE he is right that the stock will eventually go up again some time in the future while the chart moving down, by all means, let him hold on as long as he like. 2) IF the market is on side-way, using Trend Trading Method would incur in lost, therefore, one need to learn to learn the master the skill of CUTTING LOST. It would be so much better to acknowledge that was only a small error made in the market rather than let it continue to grow and eventually becomes a BIG MISTAKE. The following are more charts to illustrate the points mentioned above. NOTE: If Argiculture commodity is moving down or in a side way, chances that those related companies are not performing too, even if whatever fundamental data of the stock are strong. Use the money to invest someway else, and wait untill the relevant commodity to move up, then buy the related stocks. I am from Brazil and i am a big fan of your blog!! You explain the ideas of Livermore very good but still did not understand the rules of livermore. I am some time trying to decipher the book livermore how to trade stocks but without success so far ... you can not provide this code for us? In the earlier article on Jesse Livermore Key as indicator, I posted the full algorithm flow chart, and the code. I also pointed out in the previous post that when I wanted to program this indicator many years ago. I failed to understand on the first attempt... I kept it aside and attempted to do it the next year, and failed again. Only the third attempt one year later I got the concept right. Not just get the program done, but also have a better understanding of his philosophy of doing so. And, this time round, I spent only one day to get the Band on Chart done. Also to point out that, the figure 1 and 2 are specifically drawn in such a way that if one understand the concept, he can get it done. My suggestion is this: Don't trade/program it alone.... start your small Master Mind Team with the same mind and work together and that would save you lot of time. You mean then that this code is equal to "Livermore Market Key" from your previous post? But without the ATR and no bands in the price, right? That percentage you programmed is the same as "Threshold Percente Units"? Very good I will try to add these parameters (ATR) to make new backtests. One thing I would really like to understand is how to fill in paper prices equal Livermore did. The purpose of knowledge. In his book he leaves confused ideas. Anyway, congratulations for being persistent and keep this amazing blog, I'll take your advice into consideration. No. The new code is very much simpler for it can be programmed only looking at figure 1 and 2 without flow chart. But, the fundamental concept is the same. If you were to use the previous flowchart, you need to do some modification in update the band level when it change states. So, my recommendation is this... Use the previous flow chart just to understand the concept, digest it and throw it away, then create you own base the the two figures. The Key Concept in the Livermore Key is using a Pivotal Point to workout the bands as filter. The Pivotal Points can be Reversal or Continuous(in a trend), and at anyone time ONLY one Pivotal Point is used, which is the most current one. Anyway, all chances are man made. For the link in this one, I'm still confused how to use it to call this function. Is it just easy to use as replacing the "getscore();" in positionscore ?? I replied this class of question many times. And this would just be the same answer. Any programming and technical question related to Amibroker, plese join the Yahoo Amibroker user group. There are many friendly people there to help each other out. Lets say you don't want to program the system and just want to do it by hand like livermore did. What prices were being recorded in the system? Was it the high/low of the day? open/close? For those who vote for close because they think that the High/Low could be noise and Close is more accurate. For those who vote for High as Highest Band Pivot and Low or Lowest Band Piviot because we do use High and Low to draw trendlines. how to get jesse livermore indicator?? I did not release the code for this (yet). But, the concept is clear enough for people who has the burning desire to do so. If you know how to program, you may program it with the concept. Or, get a small Master Mind Team with a programmer to work on it. I read the post, I use worden and do not know who to constructc the indicator. How do you build the centerline? 20 ATR that you add or subtract from High low? When I have the centerline every level up or down is 2% from the previous level starting from the centerline? In Livermore time, they use pivot point. So, the calculation of the center-line is based on pivot-point. Is there a program available for this yet? very informative many thanks for the share, bless you more!